I don’t know the whole story behind these cards. Looks like the AHRA (American Hot Rod Association) worked with Fleer to put out these cards for 3 years(?). 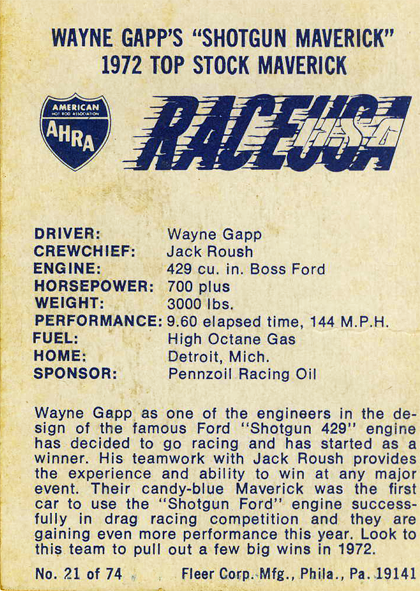 Regardless, here is the Wayne Gapp card for 1972. Features the Blue Maverick. Here is the back with a nice blurb. 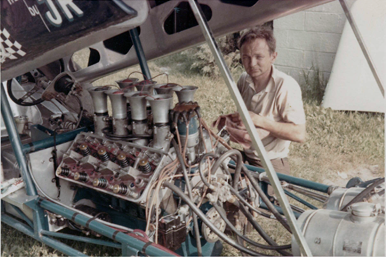 Wayne Gapp’s Michigan Cougar won the S/SI money when “Buckeye” fouled. 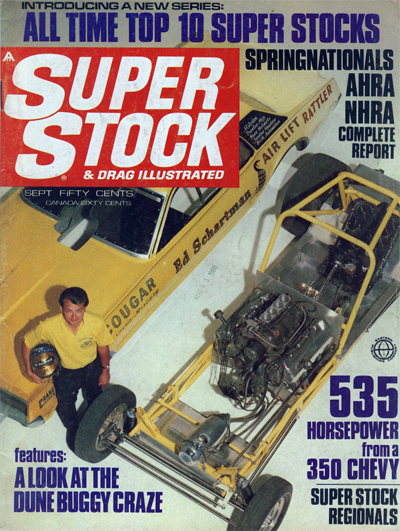 …Then it was time for AHRA’s biggest attraction, the gas funny cars. The 2400-pounders would go at it heads up for a $1500 prize kitty.The circuit, which is overwhelmingly hemi-dominated had just completed a hectic ten-day racing schedule all over the eastern half of the country; the men and machines were tired, but they put on a great show. First round action included the elimination of George Weiler’s “Mr. Violent” Camaro by Tom Sneden in the Bob Banning Dodge Charger, currentl the quickest and fastest car of the lot. 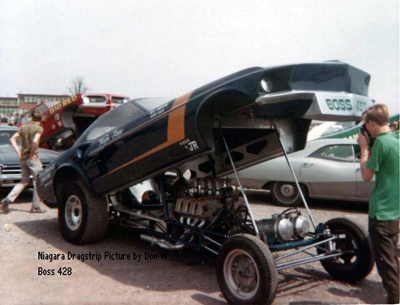 Pee Wee Wallace dropped Al Joniec’s tired SOHC Mustang, 9.94 to 9.93, Tom Smith, in the “Virginia Twister” gasser lost to Buck Phillips ’68 ‘Cuda and Wayne Gapp’s Cougar SOHC nailed the second Buckeye car. 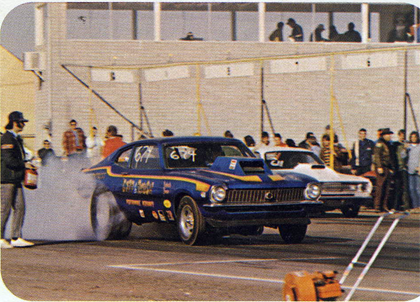 Dan Smoker dropped Jim Lake’s Barracuda, and the “Flintstone Flyer” of Dave Koffel drew a bye run. Then it was Sneden over Wallace, 9.74 to 9.86, Gapp over Buckeye at 9.89. Dan Smoke and Dave Koffel diced the whole way down, with the Virginia car of Smoker coming out on top at 9.87. To make a complete semifinal, the Buckeye Barracuda, Earl Phillips driving, was reinstated for having the lowest ET of the second round losers. With this done, Smoker and Phillips met and the “Baltimore Bandit” won out, 9.80-139 to Smoker’s losing 9.82-141.50. In the other match, Tom Sneden fouled out against Gapp with the strongest run of the event, 9.68-142.40 to winner Gapp’s much slower 9.88 and 139.10. In the final for the money, the Inkster, Michigan, cammer ran a 9.91-138.24 against the Baltimore Barracuda’s red light 9.89-139.10. Here’s the cover from the Issue. Here’s a shot of the ’69 Mustang. Finished mechanically and waiting to get a bit more on the paint side of things. A few things about this photo. Two…he’s working on the Boss 429 Mustang Flopper. Three…he’s outside of the garage where his business “Performance Engineering” was located in Dearborn. This was the location before moving to Livonia. Lastly. 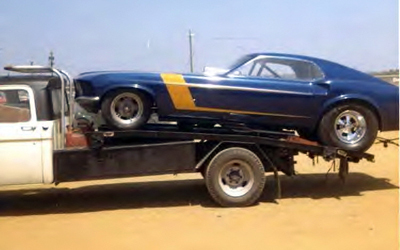 Look at that fuel-injected Boss 429! Side shot of the Mustang. Nice color shot showing a bit more detail of the vehicle. 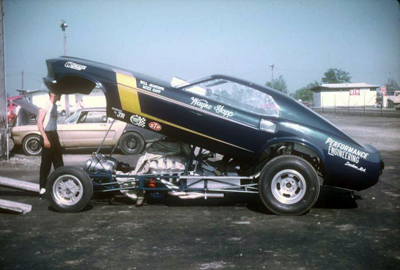 This car was built by my Dad and Bill Jameson to compete in the AHRA-sponsored Gas Funny Car circuit on the East Coast. Fuel injected Boss 429 power.